Through my own Decolonization process I have been engaging in my Anishinabe Peoples own Institutions to remove the colonial influences in my life. One of these tools I have been using is through the healing approaches of our spirituality where I have come to identify colonial attitudes embedded in our own Indigenous institutions which are creating a synthetic resurgence of our collective Identity. I have established relationships and met many of our people who have been influential in the revival of the spiritual aspect of our Indigenous Institutions which has become an expressed ideology known as “Traditionalism.” This Traditionalism is viewed by those who embrace it and those who oppose it as something that is separate to our collective day to day modern Indigenous identity. The attributing of our peoples way of life and all the things that make us who we are as being “Traditional” limits the goals of what we are continually trying to achieve. Traditionalism though it is centered on Indigenous Spirituality like everything within our communities still has colonial attitudes attached and we must acknowledge that “Traditionalism” is a significant approach to of our shared Decolonization Process but is not the whole movement itself. Traditionalism when used as an approach to replace existing colonial institutions in our communities mistakenly creates an illusion that something western has been replaced with something authentically Indigenous but most time those same colonial values still exist. This rant is a call out to those who are conscience of the illusions that are disguised as our own Indigenous Institutions and the attributed colonial behaviors that follow so we can create awareness for those who are ready to reclaim their identities and start their own Decolonization Process. Traditionalism, Hierarchy and Elitism: Spirituality is the center of our Indigenous Being and in our history our Spiritual Institutions were subject to changes where another world view was introduced which affected these things and also where our Spiritual Institutions made illegal by our oppressors which forced us to keep these things hidden underground, where these things were almost lost. Now we are seeing a resurgence of our Spiritual Societies and Ceremonies thriving. With this we should not be so ignorant to believe that our Spiritual Societies are not exempt of the colonial stains which have infiltrated our other Indigenous Institutions. We need to be conscience of this and correct oppressive behaviors within our various societies as we are seeing a majority of our people return to our ways where they are doing it through our Spiritual Institutions. Although our spiritual societies play a significant role in our decolonization process traces of colonialism is still entrenched in them instilling passive values which are making us submissive to our oppressor. We must also not make the mistake that “Traditionalism” or our Spiritual Institutions is the only thing there is to our Identity. We also have our own political, judicial, warrior, hunting, medicine, economic societies to reestablish. My friend who has been involved with the Three Fires Midewewiin Lodge for most of his life and who is a prominent person who holds a specific degree in this society has helped me with some issues in my healing. He has helped me to understand some things with our Spiritual Societies. I didn’t ask to use his name in this article so I will leave it out in respect but will share what he described to me. As he helped me to understand some things he also told me that there are two kinds of people who enter to the lodge. This helped me understand a whole lot because through my own colonial values that have been embedded in my upbringing I automatically assumed all the people who followed this way were all healed as I put them up on a pedestal and attributed them as “holy rollers” because they were following these ways. These colonial thought patterns that mainstream society conditions us to make also make a small number of people involved in this work to place themselves up on that same pedestal as well. In our Indigenous worldview we are all equals and have our own roles to play within our community where respecting the free will of every entity in creation is understood. Today’s utilization of our spirituality is sometimes creating a hierarchy and elitism by some people who identify themselves as “traditional” or “initiated” or “sober” and some place themselves above others who may be on another level of their own healing journey, or who play a different role within the community. This egotistic attribute employed by some is a western value that is not based on Indigenous teachings of humility. Although ego is a human condition and affects all races, colonial thought patterns and values that our people have adopted through assimilating into mainstream culture seem to be intensifying such colonial behaviors which affect our Spiritual Societies. The individualistic ego behavior is creating elitism, hierarchy and belittlement which turn some of our people away from their individual decolonization process, healing and at times even against our own Indigenous Identity. In my experience and opinion some people who have certain issues who follow our ways make it seem that our ways are personally belong to them because of their seniority in the “Traditionalist” movement or because their families followed our ways longer than others. This creates a feeling that we need to seek them out for permission in everything “Traditional” that we invoke. Our Medicine Societies and Ceremonies entrap non-natives and even our own people in a small box believing that this romanticized “spiritual” world view is all there is to our Indigenous Identity. Sometimes the “Traditional Healing Movement” is a barrier itself to healing and Decolonization. These Spiritual Institutions also serve as a place where our people are flocking towards for healing and where a percentage of the people within these “societies” still retain deep internal unhealthy issues which affect their behaviors. Some of these people who are not well are giving the perception that they are spiritually healthy by belonging to these spiritual societies. They need to be told that they are representing these spiritual societies and are turning others a way. At the same time I would like to acknowledge and honor those spiritual people who are out there who are true to the teachings and are representing what it means to be Anishinabek having a Good Heart and who really have a connection with the Spirit. Powwows: Inter-tribal Gatherings that included Political, Military, Economic, Social and Ceremonial Societies of our Nations has now been replaced by the Pan-Indian Traditional Gathering of Powwow. Powwow has become a “Traditional” Gathering that showcases and has been a benefit of the reemergence of our Songs, Dances, Arts and Crafts. Some Powwows serve as Competitions for Dancers and Singers involving prize money and some are Traditional centering on honoring communities through song and dance. As a “Traditional” Dancer and sitting with a few Drum Groups over the years I have noticed that other aspects of “traditional gathering” are not present. I observe at Powwows where community members who want to particpate by providing the “traditional” act of “giveaways”or other “specials” seems to be marginalized by the Powwow Community because it takes too much time away from the singers and dancers. I have also observing Egotistic behavior and honorarium issues within drum groups and dancers which has also made me question if our values and teaching are being compromised just for the showcasing of our culture. Also Politics, Militancy or too much Ceremony seem to be unwanted at Powwow but organizers allow Colonial Armed Forces and Police Agencies to participate. At a few Powwows I have also noticed people who are coming from communities who are engaging in either an occupation or blockade or protest, who come to seek support are turn away from Powwow MC’s who tell them Powwow is not the place for Politics or Militancy. In Powwow there are many teachings. One of these come from the Grandfather Drum Teachings which is used at the Powwow by most Indigenous Nations. One founding teaching says that the “Big Drum” was given to all Indigenous Nations by a Woman. During a time where all tribes we at war with each other this Woman was given a vision. In her vision she was given a “Big Drum” along with seven inter-tribal songs to teach to all the Nations so all Nations can sing and gather together to end the inter-tribal wars that was destroying the people. Teachings say that only Men can sit at the drum and Women are not because of the power of Creation that they hold. There is a new phenomenon happening where Women are sitting and singing and carrying the Drum breaking this “Traditional” taboo. These Women Drum Groups who are doing this are being asked to leave Powwows by a majority of “Traditionalists” involved with Powwow. The teaching that these Women Drum Groups are sharing to why they sitting at the “Big Drum” is that they are reclaiming the drum because most Men are forgetting their responsibilities. We are no longer standing up to protect our territories, the earth or are respecting our women or standing up to protect our Nationhood to defend the Peace. The Grandfather Drum is being carried by a generation of Men who are abusive to themselves or their people is the message these Women Drum Groups are sharing. If it was through Women that gave Men the Grandfather Drum in the first place to end inter-tribal wars to create peace between our Nations and are so powerful for being close to Creation, why we using “Traditionalism” to shut out a message that needs to be said? Is there acceptance of the evolution of a new kind of Powwow? or even the rekindling of the spirit of what our “Traditional” gatherings used to be about? We now divide ourselves in specific circles to gather as Chief and Council, Medicine Societies, Powwow, Blockades, Ceremonies, Occupations, Fish and Hunting Camps, Economic Conferences. How is Powwow reflective of what our culture is as a whole? How is it nurturing our spiritual reemergence if it only concentrates on only a certain social group within our Nations? Traditional Elders: I often am told by “Traditional Elders” that my place is either silently standing behind the women, tending the sacred fire when protecting our people, rights and territories or that occupations and blockades are only a “Mohawk thing” and I must do things in a good way. I choose to believe that our people’s responsibility to protect our people, rights and territories is not just a responsibility of the women. If our teachings tell us anything it is to walk beside and not in front or to place anybody behind you and if someone is a threat to your well being it is your right to defend yourself. Any direct actions that challenges the State authority is almost always opposed by “Traditional Elders”. Our “traditionalism” then preaches on values that makes us complacent and passive which tells us not to be the physical warriors we once were ready to defend our well being. Cultural Appropriation: We are a part of a new Generation of Indigenous Peoples that has been brought up with “Traditionalism” where more aspects of who we are is now acceptable within our communities. We are now in a time where we are regaining those things that were taken away from us but as we still retain colonial values we are now exploiting our cultural knowledge and relics. We are seeing our communities use symbols and relics of our culture such as Headdresses. In the past, some traditions required each feather to be earned until enough had been acquired to fashion a headdress. 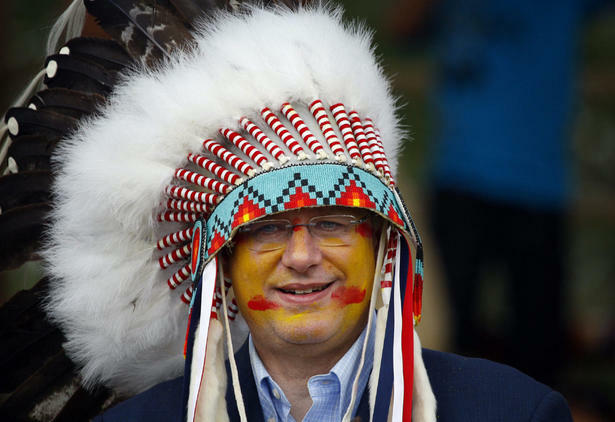 Nowadays, this type of tradition seems to be irrelevant and the main requirement for wearing a headdress is to take advantage of a good photo op. We have Indian Princess Pageants in a culture that never had theses things. We are using Teachings, Ceremonies, Language and placing Cultural logos on Colonial Institutions, Policies, Bureaucracy, Self Governance, Land Claim Settlements fooling ourselves that we are progressing and reclaiming our identity. We are now being are own oppressors by utilizing “Traditionalism” and placing it as a guise over Colonial Institutions. Superiority: As a new Generation of Warriors organize to defend our rights, territories and people there is a lot of criticizing from the older generation of Warriors. Some of our “Traditional” Elders in our Spiritual Intuitions were a part of the generation in the 60’s and 70’s that was a part of our spiritual resurgence and warrior societies where AIM was influential in this process. I have been told many times of these Elders that this was the last generation of warriors of moral standing. Although great work came from this generation which us younger generation are thankful and inspired by they must also acknowledge that we too are also a new generation part of a new warrior movement that has brought hope and change through Oka, Gustufsen Lake, NYM, Ipperwash, Burnt Church, Grassy Narrows, Kanenhstaton and also through the many Artists who are bringing our message and truths out in the open through various mediums. The moral standing of our contemporary movements should not be criticized by our Elders who were of AIM generation. People who call themselves “Traditional” and judge our young generation of Warriors as being immoral need to for sure address their own colonial attitudes and stop placing themselves above others. Sometimes these Elders forget that they were too Armed for Defensive Actions . AIM although they have their place in our history is not the beginning and end for our Decolonization or Warrior movements. Superiority is also an issue for those who have been participating a lot longer in the struggle. As our people begin to reclaim our Indigenous Identities “Traditionalism” which was initiated in a resurgence movement in the 60’s and 70’s where AIM was an influential force and centered themselves on Spirituality and where today’s Traditional Elders were a part of this generation we as a younger generation must learn and speak out from the mistakes and current colonial behaviors that are dividing us which sometimes comes from our Elders and Spiritual Societies as well. We must not exempt our Elders and Indigenous Institutions from colonialism because they are represented as being organically Indigenous. Non Anishinabek People from other races are participating in a movement of their own where they are learning from our ways and starting their own healing process as a people who are realizing their own Capitalist Society is destroying everything. Sometimes this movement is referred to New Ageism which is a melting pot of global spirituality because their own ways have been oppressed and lost. They are flocking to our Spiritual Institutions to learn from us which is a good thing but they are also bringing their colonial attitudes with them. I recently attended a sweat lodge before I went out fasting where I was seeking guidance from the spirit to help me in my own decision that my community is faced with. A non native participant of the sweat and an acquaintance who happens to be an A.A Sponsor to numerous people made some comments to me at this sweat as if I was one of his people who he sponsors and made me feel belittled. He vaguely knows who I am and what I am about and only knows me as an acquaintance through ceremony because his girlfriend is herself on a healing journey and involved within the Three Fires Midewiwiin Medicine Society. Anyways he told me that he was very worried about me and that he was glad that I attended the sweat and am back on the healing “path”. He was worried about me because of my apparent anger issues and prejudged my attendance at the sweat and my fasting with his own opinion where he suggested I needed the healing which offended me. He was referring my apparent anger issues to videos I posted on a social networking internet site where I shared some how-to videos on self defense trap maneuvers in guerella warfare which apparently offended him. In any Society some of the people need to be providers and some need to be warriors to protect the people and territory from threats and active training is a part of this. The resurgence of our warrior societies is just as important as our medicine societies. This non native person viewed my training as something angry which caused him to overreact through worrying which affected his wellbeing and where made it seem that he was above me. This is a perfect example how a narrow mindset can cause assumptions which causes problems. This person participation and preaching on Anishinabek Healing is a good step but is a waste of time if he still possesses and clings on to mainstream attitudes. He thought I needed healing for anger issues but choose not to inquire why those videos were relevant in my path. If those videos were on hunting which is also a violent activity I wonder if he would’ve thought I still needed healing for my perceived anger issues. Sill after explaining to him why these man-trap videos are important and speaking my peace with him he still chooses to force his belief system onto my free will. Non-Natives who want to cloak themselves in Indigenous “traditionalism” need to decolonize themselves of their western attitudes when choosing to take up our “ways” otherwise they are just playing make belief and can cause damage. Do I have to share what happened to the non-native capitalizing by conducting sweat lodge ceremonies in a New Age Texas Retreat? I will leave this article with a quote from Dr. Wendy Makoons Geniusz who is from the Anishinabek Nation and is director of American Indian studies and assistant professor of foreign languages at the University of Wisconsin, Eau Claire. She teaches courses in traditional American Indian cultures and the Ojibwe language and is also an author. Woman used to be the ones that stood behind the men, and recently we have taken the responsibilty of up front and centre in many situations. Woman warriars, many men have let us down. Maybe its the colonial thinking and acting, or ignorance of how to be a tradional man in todays society. How to be a tradional person in a society thast so money orientated is definaltly hard. But when is comes to abuse towards woman, we retook places that were freely given to men, by a woman at one time. Of course these things were given to the men by our creator god. Woman sitting at the drum in only on instance. When we go to an event where were standing up for injustice, unfortunatly the majority is woman. Somewhere we need to find the balance. There are many organizations and events for woman to heal in our tradional ways. Support each other in our healing path. But men are lacking in the same services. I once talked to a man who had a great idea.. Aplauded him about his idea. He wanted to open an organiztion in the big city of Toronto called aborigiinal mens centre. This would give men the area to heal and express and learn how to be a trational man in todays society. I cried one time to one of my elders at how our family systems have broken down and woman hold the percentage of caring and raisng our childeren. But we need our men to be more like this man..decoloinize grow in our tradional ways. Be our warriars once again so we can stand with them. We were called names in many languages like “Silent power” men speak for us again. We told our men what needed to be said, and they took care of us like that. Balance, everything is about balance. Not power…that needs to be exluded in our tradional ways of life. I like the idea of the information that is being shared here. There are those who have comments that could be added, or that could offer additional information to explain some of the teachings that have been presented here.